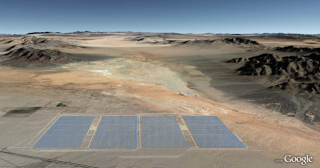 Calico Solar Avoiding Responsibility for Environmental Damage? In a document submitted by Calico Solar LLC (Tessera Solar and Stirling Energy), the company proposes weakening conditions proposed by the California Energy Commission (CEC) requiring it to conserve nearby Mojave Desert wilderness to compensate for the loss of endangered species. The proposed Calico Solar power project would displace or kill at least 100 desert tortoises currently located on the site, in addition to several other special status species, including desert kit fox, burrowing owl and foxtail cactus. Among the Mojave Desert treasures at stake as energy companies lay claim to vast tracts of BLM-managed desert wilderness are relatively unspoiled scenic vistas. The view below was taken at dusk in the protected Mojave National Preserve. Only a stretch of the lonely Kelbaker Road is visible in the distance and leading off to the west of creosote scrub and lava flows. The California Desert Protection Act of 2010, introduced by Senator Diane Feinstein, could help preserve more Mojave treasures before they are bulldozed by improperly sited industrial-scale energy development. In the meantime, it is up to the California Energy Commission (CEC) and science-based surveys of Mojave and Colorado Desert resources to prevent the "solar rush" from trampling irreplaceable wilderness and wildlife. What is striking is that the water usage of the Ridgecrest site, which is a dry-cooled plant (so presumably it is much more water efficient than other proposed solar sites) would still have enormous impacts on ground water. Ridgecrest's consumption of approximately 150 acre feet a year is dwarfed by the consumption of the proposed Abengoa Solar site near Barstow and Helendale, which would consume nearly 1,077 acre-feet per year. If you could not make it to the 23/24 April Public Workshop, you can attend the 3rd or 4th May workshop focused on biological resources at Ridgecrest City Hall at 8AM. Desert Xpress Train Nearing Construction; Mag-Lev Still an Option? I've written before on two competing high speed rail trains proposed for the Mojave Desert, which would connect Victorville and Las Vegas. According to the developers of Desert Xpress, their high speed rail project is close to breaking ground and could be operating in 2013. What is not clear is whether or not the Desert Xpress would take the place of the proposed Mag-Lev train or if they could offer duplicate mass transit service crossing the Mojave. The Mag-Lev train reportedly received nearly 7 billion dollars in financial backing from China. As I have mentioned in previous posts, there is a lot of potential change for the Mojave Desert landscape over the next year with so many proposed industrial projects. Ivanpah is the solar project furthest along in the California Energy Commission (CEC) certification process and it looks like it will receive it's approval, although hopefully with plenty of mitigation conditions. The two photos below were taken last month in Ivanpah, and include construction and survey markers already on the proposed site. If the CEC gives it's final approval, construction equipment could me mowing this land by late Fall 2010. 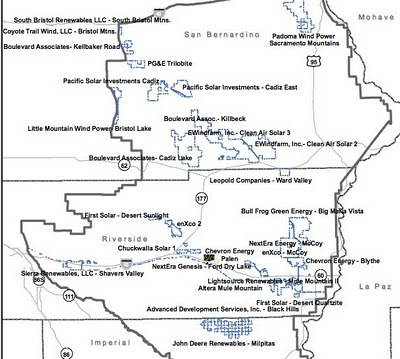 I was looking at the Palen Solar Power Project Environmental Impact Statement, and the California Energy Commission (CEC) Staff included some maps of other major energy projects proposed for the Northeastern Colorado Desert. Some of the projects that have been proposed by have not begun CEC review are massive, and dwarf sites that have already been deemed to be harmful to desert wilderness in California. As the mega-sites--some of which are several times larger than LAX--begin the biological surveys we are bound to learn of potential consequences for the desert that are far greater in magnitude than we have seen with other projects covered on this blog. The Board of Commissioners for the Los Angeles World Airports is considering leasing land it owns near Palmdale and Lancaster to solar energy developers. It's not entirely clear where the land is located, but according to recent statements, it is likely near the Palmdale regional airport and US Air Force Plant 42. Most of the land in that area would probably be considered disturbed, so perhaps prime solar siting territory. The only problem would be if the land is actually to the east of the city where there are actually a few wildlife sanctuaries. Much of the Western Mojave (in the vicinity of Victorville/Palmdale/Ridgecrest) is so close to population centers that the wildlife in this part of the Mojave could be considered to be under more pressure than the Eastern portion of the desert. According to the California Energy Commission (CEC), there will be four public workshops held to discuss the proposed Ridgecrest Solar Power Project. The workshops will give members of the public an opportunity to discuss or learn more about the recently published staff assessment and environmental impact statement for the project. The first pair of workshops in April will address water, soil, visual, air, land use, and traffic issues. The second pair of workshops in May will address biological resources. You can read more about the staff assessment and EIS on a previous post on this blog. Once again I'll stray from the namesake of the blog and address an industrial project proposed for the Colorado Desert (a subzone of the Sonoran Desert). Since the recent gold rush of solar projects will have impacts that affect species that roam to and from the Mojave Desert and neighboring Colorado Desert, I've been tracking projects throughout southern California. I've come across a few instances of press articles and editorials that criticize the California Energy Commission's (CEC) proposed biological conditions imposed on the Ivanpah Solar Electric Generating System, and the CEC Staff's recommendation against the Ridgecrest Solar Power Project. The criticism contends that economic development is held up for the sake of "squirrels" and "turtles", referring to the endangered Mojave ground squirrel and desert tortoise. The argument assumes that all business decisions are wise ones and that our country should essentially grant right of way to industrial development wherever the private sector points on the map. I have two problems with these critics. 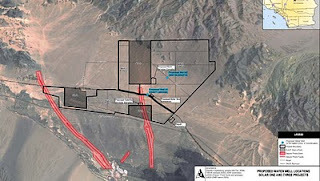 On 1 April, the California Energy Commission Staff posted its "opening brief" for the final consideration of the Ivanpah Solar Electric Generating System site proposed for the northeastern Mojave Desert. Overall, it continues the trend that I've posted about before on this blog -- that the CEC is likely to rule in favor of BrightSource Energy building an approximately 3,237 acre solar field on biologically important public land. The next and final steps will be important in determining how much the private energy firms will be held accountable for mitigation procedures if they choose to develop on public land that is of biological value. It is in the interest of the public that energy firms, such as BrightSource, that propose building on land that holds so many threatened biological resources should be required to pay for conservation measures that can off-set the damage done by the project. Just getting around to giving a read-out on my late March camping trip in the Mojave National Preserve. We started out with a drive to the lava cinder cones in the western portion of the preserve. Lots of shrubs blooming along the road, and some wildflowers here and there. Plenty of greenery on the desert floor amidst the lava flows and the cacti looked fresh and ready for the spring. The lava tube is definitely worth checking out. It's just a short walk from Aiken Mine Road. The rough cinder walls of the tube are broken in spots at the top, allowing a flood of light to enter. The cinder cone area is scattered with creosote and Yucca, with some ephemeral washes coursing through the lava flows. I promised a read-out of my camping trip to the Mojave National Preserve -- I have not gotten around to summarizing the trip yet. But I can say that the Preserve should be seeing some nice wildflower blooms this weekend or next. When I was there the ground was green and there were fields of yellow and purple, but many of the cactus and other blooms had not peaked. Here are shots of some of the flowers I photographed during the trip, weekend of March 26. The Calico Solar (formerly SES Solar One) project proposed for the Pisgah area was deemed to have significant impacts on biological resources, according to the draft environmental impact statement produced by the California Energy Commission (CEC). The Calico Solar project, which would be built on approximately 8,230 acres of Mojave Desert public land.